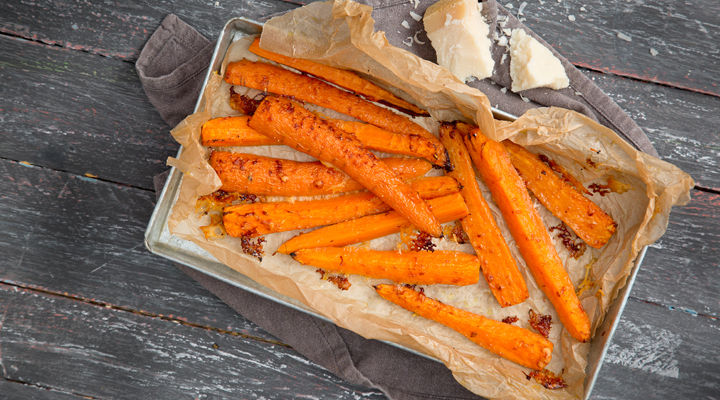 A twist on classic roasted carrots. Preheat the oven to 200°C/gass mark 6. Line a baking tray with non-stick baking paper. In a small pan, melt the butter with the olive oil and garlic. Simmer for 2 minutes to soften the garlic and infuse the butter. Remove from the heat. Put the carrots on the lined tray. Drizzle the garlic butter over the carrots and season with salt and pepper. Roast in the oven for 15 minutes, shaking the tray every 5 minutes to evenly colour the carrots. Remove the carrots from the oven, sprinkle over the grated Parmesan and put back in the oven for another 10 to 15 minutes, until the carrots are cooked through. Scatter over the chopped fresh parsley just before serving.